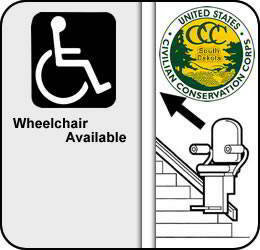 The Civilian Conservation Corps Museum of South Dakota is a 501(c)(3) non-profit organization. It is located in the upper floor of the Hill City, SD Visitor Information Center, 23935 Hwy 385, Hill City, SD 57745. It is funded entirely by donation and the displays, materials, an annual open house, our website, etc are provided by local volunteers. 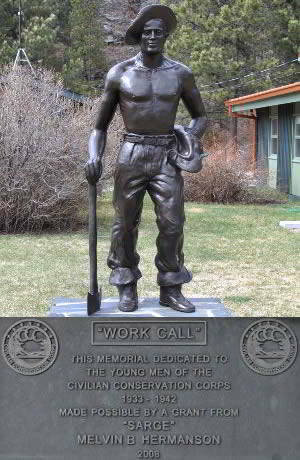 In March of 1933, President Franklin Delano Roosevelt "FDR" established the Civilian Conservation Corps (CCC). The CCC was a public work relief program that operated from 1933 to 1942 in the United States for unemployed, unmarried men from relief families as part of the New Deal. Originally for young men ages 18-23, it was eventually expanded to young men ages 17-28. Robert Fechner was the head of the agency. The goal was two-fold: conservation of our natural resources and the salvage of our young men. The work of America's young men dramatically changed the future. More than 30,000 men contributed to the many significant projects in South Dakota and were able to help support their families back home. For further inquiries, questions and comments visit our contact page and be sure to stop at the museum when you are in the area. 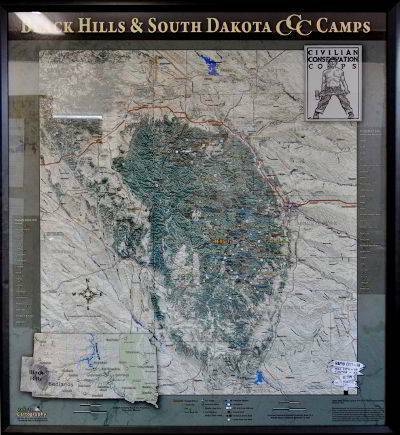 The Civilian Conservation Corps Museum of South Dakota is "a museum in which the historical significance and accomplishments of the Civilian Conservation Corps are recognized and perpetuated."